As of April 1, 2008 the following changes and amendments to the fishing regulations have been made. Coastwide prawn and shrimp trapping changes. Recreational prawn and shrimp by trap fishers are reminded that effective 00:01 hrs April 1, 2008 all closures (including "pulse fishing" closures) will be revoked, thereby allowing for the recreational fishery for prawns and shrimp by trap, ring net, or spear while diving to resume in all coastal areas seven days per week. 19-7 to 19-12), and Alberni Inlet (Subareas 23-1 to 23-3) be advised that a one week closure will be in place from 00:01 hrs May 1 to 23:59 hrs May 7, 2008. This action has been approved by the Sport Fishing Advisory Board (SFAB) and the Prawn Industry Caucus to allow for the completion of comprehensive spawner index sampling surveys at the start of the commercial fishery and is part of the agreed upon plan for these high use areas. Variation Order Number 2008-125.
coastwide. Refer to the 2007 to 2009 B.C. Tidal Waters Sport Fishing Guide for further information. during the period of March 11 to May 15, 2008.
chinook salmon between 45 cm and 67 cm in length in Subareas 19-1 to 19-4 and Subarea 20-5 (Those waters near Victoria between Cadboro Pt to Sheringham Pt). Refer to Fishery Notice FN0131 dated March 07, 2008 for further details. 67 cm in length will also be permitted as described below. 45 cm and 67 cm in length or hatchery marked salmon only that are greater than 67 cm in length in Subareas 19-1 to 19-4 and Subarea 20-5 (those waters near Victoria between Cadboro Pt to Sheringham Pt). Sheringham Pt) the daily limit is two (2) wild or hatchery marked chinook salmon per day between 45 cm and 67 cm in length. An option to retain hatchery marked chinook greater than 67 cm is still under consideration. 29-7, 29-9 and 29-10 the daily limit is zero (0) chinook salmon. Subareas 29-11 to 29-17 and Region 2 are currently no fishing for salmon. is zero (0) chinook salmon. Effective April 1, 2008 to March 31, 2009 in that portion of Subarea 12-41 commonly know as Nimmo Bay lying north westerly of a line drawn between two square white boundary signs it is prohibited to the use of a single barbless hook that measures no greater than 15mm between the point and the shank of the hook. The line is from the boundary marker on Nimmo Point (50 degrees 56.282 minutes N, 126 degrees 41.495 minutes W) to a boundary marker on the mainland shore at (50 degrees 56.373 minutes N, 126 degrees 41.303 minutes W). Congrats on what looks to be another great blog! Your starting to make me look bad by having more pans in the fire then I do!!!! Thanks for the kind words Kevin. Fishing is the number one recreational activity here in British Columbia in addition our province is the favorite destination for sport fishers from around the world. 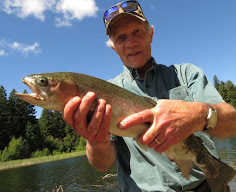 A search on the intenet for a blog on BC Fishing failed to yield any results and so I thought that it might be high time that there is a blog about the subject.